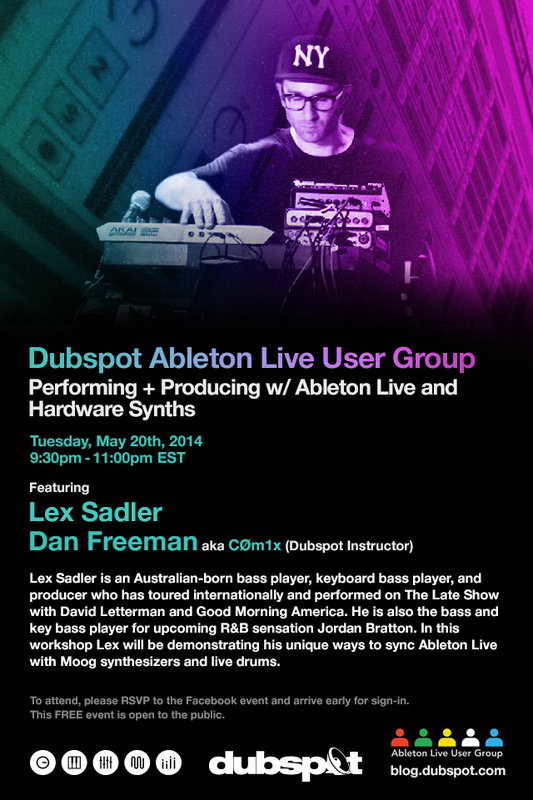 On Tuesday May 20th, our Dubspot NYC Ableton Live User Group continues with guest instructor Lex Sadler and host Dan Freeman (CØm1x). Dubspot NY – 348 W 14th St.
Lex Sadler is an Australian-born bass player, keyboard bass player, programmer and producer residing in New York City. Lex has toured nationally and internationally with numerous artists including Blitz The Ambassador & Dana Leong, and has performed on The Late Show with David Letterman and Good Morning America with pop songstress Ellie Goulding. Lex is also the bass and key bass player for upcoming R&B sensation Jordan Bratton. In 2012, he launched his solo project ‘Rhythm & Stealth’, with debut album ‘Twenty Three Seven’, a self-produced genre bending record that recalls the electronic sounds of the UK underground. Rhythm & Stealth’s live show combines electronic sounds and live instrumentation, and features a broad range of New York’s finest musicians.